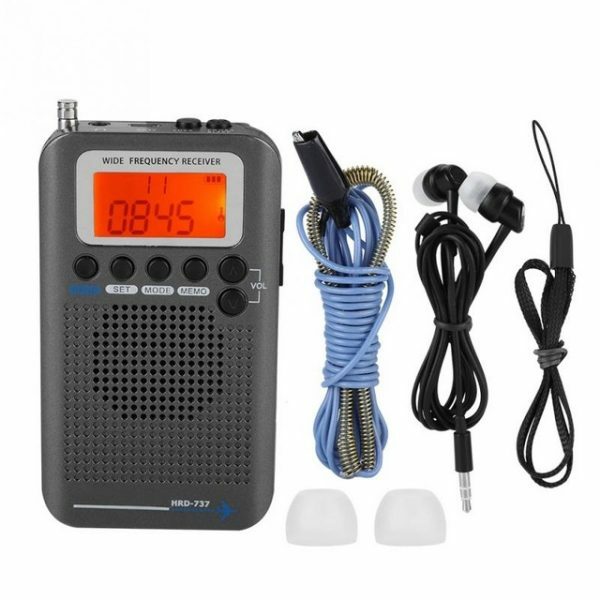 Portable and easy to use, this Air Band Receiver has manual and automatic search mode. You can store up to 50 frequencies in each band. 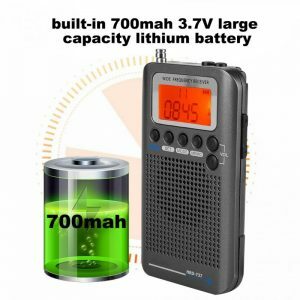 Power supply is a built-in 700mah large capacity 3.7V lithium battery. You can also connect a DC5V external power supply. Radio search mode: manual search, automatic search, stored frequencies. One inch LCD display with backlight can accurately display frequency range, battery symbol and sensitivity indication. Two ways to listen: external speaker or inserted earplug. Power supply mode: built-in 700mah large capacity 3.7V lithium battery, can connect DC5V external power supply. Setting up alarm clock: alarm ringing sound / radio automatic power on. You can set 90 – 80 -70 – 60 – 50 – 40 – 30 – 20 – 10 automatic power off time. Speaker: 40mm, 8Ω, 1W, loud and clear sound. Extended antenna to enhance the receiving sensitivity. Can store up to 50 frequencies in each band.